This guest post is authored by Paul Stainthorp, Electronic Resources Librarian, University of Lincoln. As announced last week, during October 2011 the RSP sponsored ten UK repository staff ‘buddy visits’ as part of our Open Access Week initiative. Further information available from here. Paul, Bev, and Melanie visited the University of Glasgow. As promised, here’s the first of three blog posts about this week’s trip to the University of Glasgow, sponsored by the RSP for Open Access week 2011, on the theme of Repositories and REF preparation. Three of us made the trip north: myself, the Library’s Repository Officer, Bev Jones, and the University of Lincoln’s new REF Co-ordinator, Melanie Bullock. We were received and looked after very generously by the team at Glasgow, including Susan Ashworth, Marie Cairney, Morag Greig, Valerie McCutcheon, Robbie Ireland and William Nixon. Thanks to them all for making our visit pleasant as well as useful. Over the course of a morning, we discussed many aspects of research information management, the REF, and developments to our own institutional repositories (and repositories in general). I made copious notes, and reading them back I thought it might be useful to identify and list some of the factors that seem to be necessary (or at least desirable) in successfully placing the repository at the heart of an institutional research information/administration system – what makes it possible for the repo to play its part? Good data. Because it’s not about your component systems, it’s about your data. Decide what data you have/what data you need and what you need to do with that data – then any tool that matches those requirements is the right system for you. You can always change your systems, but your data are here to stay. Design your system around your data, not the other way around. It’s necessary also to decide early what information to store, then to defend that decision vigorously – best to store the complete record of a publication or a project, NOT the filtered, controlled, ‘for-public-consumption’ version of it. Good relationships: between the library, research/enterprise, ICT services, schools/faculties, etc. : but not only at an operational/service/development level; it’s essential to have joined-up thinking about research data and systems at a management–strategic level. Glasgow seem to have this in spades. An idea of where you’re headed. Glasgow have received JISC funding to do interesting development work across a number of projects (the most notable in 2009/10 being the Enrich project), but haven’t let the funding distort their overall plan – they haven’t lost sight of the overall aim. While the outside world sees separate projects [until our visit I was personally bewildered about how it all fit together…], Glasgow have the bigger picture in mind! It’s the Research and Enterprise Operations Manager‘s job to make sure it all hangs together, working closely with the repository manager and the head of ICT services (see 2). A good development culture. The way Glasgow manage their development depends on the bit of the system in question. They have developers in each bit of the university (and centrally as part of ICT services). It’s important to recognise the [occasionally attractive] danger of rushing off and building something to meet a local need, while at the same time jeopardising the bigger picture for research administration. Taking your users’ needs seriously. Glasgow have a rigorous approach to stakeholder analysis and ‘workload modelling’. Quite often, people working in universities aren’t used to being asked what they actually need a system to do. Genuine user engagement has paid dividends. Internal miniREF-type exercises. Glasgow had a big internal drive, and more than 1,200 staff responded. Suddenly, people became much more interested in the quality of their own data(!) and in the completeness of their publication record. Having information about all known publications in one place has increased interest in metrics from the repository. Publication “healthcheck” exercises – informing a university-wide publication policy. Useful reporting tools – make it as easy as possible for your users to get data out of the system, via intuitive, meaningful export tools, and in useful formats (Excel output is always good!). Basically, reduce the temptation for people to build their own local silos of data by making it more attractive for people to invest in the repository/institutional research system, safe in the knowledge they can always get the data displayed and/or exported the way they want it. A secret agent in every faculty. Offer training and additional administrative rights to research administrators in academic departments – encourage a culture of devolved/outsourced deposit, advocacy and administration. Allow administrators to ‘impersonate’ academic authors for deposit/editing. Use bibliographic services (e.g. the Web of Knowledge) to send alerts to schools as a trigger to initiate deposit; allow schools to use these alerts/feeds to create records en-masse through filtering. Learn to talking in a language appropriate to different subject areas. Let the schools/faculties add value to the repository! Time and a head start. Glasgow’s overall research information infrastructure is well-established. Probably 90% of the system was in place 2 years ago. While we don’t have a time machine(!) we should at least recognise that proactive, consistent, ongoing development is far better than a reactive approach (“Quick! Build me something to deal with the REF!”). Invest in the repository/research information system now, and you’ll reap the benefits when an information need does arise in future. As part of Open Access week, yesterday I presented at a lunchtime session at the University of Western England (my slides are below) as part of a week of activies. The attendees were an even mix of academic and library staff which made for a lively discussion. I was very impressed by the high level of support for the repository and the engagement of the staff at UWE. I thoroughly enjoyed the discussion – it’s a real treat to delve into the issues that are critical in making OA really work. So thanks to those who took part and to Anna Lawson and Alex Clarke (the repository team) for inviting me. The current system of academic reward based on publication in high impact journals supports the status quo. There is a need to widen this to include other impact measures such as engagement with business and influence on policy making. Although, the difficulty of measuring this was acknowledged. The importance to societies of the income from journal subscriptions. The repository or “Green route” was viewed favourably but it was important to make self deposit as streamlined as possible – rekeying of information is a real barrier. There was a lot of interest in the costs of gold publishing and the likelihood of this business model becoming the norm. One academic was reluctant to deposit their own final copy rather than the published version as it hadn’t been copy edited. Although for the end reader, they may not be too worried about a few mistakes if the alternative was a cost to view it. Another academic recounted an experience where the publisher’s editing had had the opposite effect and the author’s final version was the more correct one. The cost of closed access was discussed – particularly its impact on library budgets. Metrics on use need to include a full picture e.g. downloads from publishers sites plus downloads from the repository. The JISC funded PIRUS 2 project has been exploring just this scenario. There was some concern that downloads may detract from use of the published version but it was agreed that the repository downloads could well be in addition to the traditional subscription access. Mandates which required staff to deposit their research in the repository were seen as a valued indication of institutional support but the most important thing was the enthusiasm among the academic community. The curation of research data and the issues around making this open access were raised. UWE has recently been awarded JISC funding for a Managing Research data project. This guest post is authored by Kim Coles, Information Assistant (Digital Collections), Royal Holloway, University of London. As announced last week, during October 2011 the RSP sponsored ten UK repository staff ‘buddy visits’ as part of our Open Access Week initiative. Further information available from here. Kim visited University College Falmouth who are currently designing an institutional repository which will be connected to their online research community. 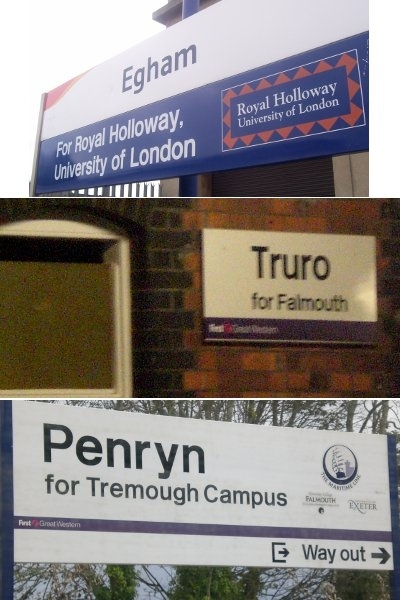 In between two rather epic train journeys (across beautiful scenery) on Wednesday 19th and Thursday 20th October, I visited the Tremough Campus of University College Falmouth (UCF) and Doreen Pinfold, Tom Readings and Tim Shear, who work in the Library and Technology Enhanced Learning Teams respectively. My original proposal was an investigation into new ways to archive arts research – thinking creatively about how the repository can work for and with researchers. The team are looking into ways of archiving arts research which is linked to the production process – in fact they have worked the research process into their planning so that the whole procedure becomes organic. They are designing an institutional repository which is connected to an online research community, the AIR Portal. This aids dialogue between researchers as well as these external users, and it is therefore easy to discuss and produce work within the AIR portal which will eventually be deposited into the repository with a single click as part of the production process. This is a method of digital preservation which ‘makes official’ the research outputs. Where the Portal is a space for production, the repository will be a way of exhibiting what is produced via Open Access, whether this is a finalised product or a snapshot of the continuing research as it stood at one point in time. This is a different and unique way to create and manage a repository, and so seemed the ideal choice for a visit. So where is the repository? UCF’s repository is not up and running, and so I had a lot of questions about how one goes about designing a repository from scratch. I found it interesting that although the team want to design according to need, they are taking a very measured and structured approach. Currently they have the opportunity to compare current repository software for functionality; allowing them to choose the parts which are useful, suggest for development those which need improvement, and suggest new archiving ideas to their researchers. Time can then be dedicated to producing something which encompasses the best of these areas and, crucially, will be backed up by good metadata standards and a sound technical base which can be adapted in the future. Then, they can trial a useable test version of the system to small groups from each school of study, to report back on. This feedback received, further work will need to be done in order to tailor the systems further, and this may happen multiple times before the finished system is released across the college. The advantage of UCF’s measured design strategy is that they firstly do not confuse researchers with vastly different versions and functions, but also that they can provide consistent clear message about archiving throughout while at the same time producing a system which meets researchers’ needs. In answer to my proposal questions, it is clear that the repository at UCF is/will be interactive, dynamic and tailored to the needs of their arts researchers. But what struck me most about the team at UCF was not only their knowledge of the subject area, but their enthusiasm, interest and excitement about what they were producing. There are a lot of opportunities available and UCF seem very much open to them. This is an attitude which I feel could especially useful to us at Royal Holloway as we move into a six-week promotional campaign to encourage engagement with our repository and CRIS. If we take constructive criticism and ideas as suggestions for improvement instead of complaints, then we could move forward and produce something applicable to our researchers’ needs. By constantly asking opinions but retaining a strong backbone, the repository can remain consistent in its aims while editing the manner in which it achieves them. Of course, we will need the support of out IT team to do this, but by returning to a ‘shared services’ approach we are able to discuss these ideas with those who have the technical know-how: vital for the development of our repository. This development could be as dramatic as a total overhaul and redesign, or as simple as offering to educate more and differently to tailor our approach as needed. There’s a lot of food for thought here as it is, but I have to say, it was very difficult to cut this down to a readable length, so if there are any questions, please feel free to comment! Lastly, though, I’d like to thank Doreen, Tim and Tom for their generosity and a really lovely visit to University College Falmouth. This guest post is authored by Annette Ramsden, Assistant Academic Librarian, University of Abertay. As announced last week, during October 2011 the RSP sponsored ten UK repository staff ‘buddy visits’ as part of our Open Access Week initiative. Further information available from here. Annette visited the Edinburgh University Data Library. Issues of licencing for re-usage, whether Creative Commons, Science Commons, Open Data Commons attribution, or any other? Meeting Robin and Stuart and being able to discuss the issues that I had considered pertinent and also ones that I hadn’t, was rewarding. It has given me a great deal to consider and investigate further and I would like to thank them for giving up their time and being so hospitable. Author: Annette Ramsden, Assistant Academic Librarian, University of Abertay. This guest post is authored by Robin Armstrong-Viner, Head of Collection Management, Information Services, University of Kent. As announced last week, during October 2011 the RSP sponsored ten UK repository staff ‘buddy visits’ as part of our Open Access Week initiative. Further information available from here. Robin visited the repository team at the London School of Economics (LSE). Like many repositories the Kent Academic Repository (KAR) is experiencing something of a mid-life crisis. Established in May 2006, it played an important role in the University of Kent’s submission for the Research Assessment Exercise (RAE) in 2008. KAR remains the most complete record Kent’s research outputs and is heavily used by a number of Schools. However there are others who prefer to record their publications through internal databases and to make the full text available through subject repositories. Mindful of the Research Excellence Framework (REF), and keen to ensure that Information Services do all we can to support the Kent’s submission in 2014, I attended the Repositories Support Programme (RSP) Readiness for REF (R4R) Workshop in September. The whole day was brilliant but I was particularly struck by Neil Stewart and Dave Puplett’s description of the mini-REF exercise they undertook at the London School of Economics (LSE). It seemed that LSE and Kent were taking similar approaches to their repositories and the REF and so I was really pleased when RSP agreed to sponsor a buddy visit for me to find out more. Like KAR, LSE Research Online (LSERO) has been established for some time and I was keen to learn how the team had been so successful in maintaining its profile with academics. Dave and Natalia Madjarevic (Neil’s successor) shared their advocacy strategy with me, highlighting the need to identify and target both early adopters and new researchers and demonstrate maximum benefit for minimum effort on the part of those researchers. The LSE approach is to make each stage of the process as simple and clear as possible for academics. There is a single point of contact for researchers while RSS feeds allow departmental, individual and LSE Experts web pages to be updated automatically. LSERO is also harvested by key subject repositories including Research Papers in Economics (RePEC). All this, together with a Twitter feed, means that LSERO plays a key role in disseminating LSE research. Talking to Dave and Natalia reminded me how important it is to demonstrate KAR’s impact. They share metrics including citations, downloads and page views with academics. Showing that including an academic’s research outputs in LSERO improves their ranking in Google Scholar is another way of encouraging deposit. The team also make sure they keep researchers up to date throughout the deposit and review process. Responsibility for KAR is shared between the Academic Liaison, Digital Resources & Serials and Metadata & Processing teams within Information Services at Kent. Natalia explained that LSE have a similarly distributed team with the E-Services team focusing on advocacy, copyright liaison and strategy and the Bibliographic Services team entering and checking the accuracy of the metadata. A key advantage of involving a wider team has been that they have been able to maintain service levels even at busy times. Dave emphasised how important it was that LSERO was seen as a core role of the Library (and not just the E-Services team), including by the Director. Other teams have been updated on progress through a series of lunchtime seminars, and Dave has been careful to give credit to the wider team for the success of LSERO. Kent is planning a mini-REF exercise in 2012 so I was interested to know what had made the exercise at LSE so successful. Dave explained that the content, consistency and accuracy of the LSERO data had impressed the Research Division. By generating reports of research outputs by department and highlighting that the they had the skills needed to deliver excellent quality data the team revealed the value of involving the Library. They had also used research managers within individual departments to ensure that as many research outputs eligible for that REF had been captured within LSERO. Having recently moved to Kent from Aberdeen I’m new to both KAR and EPrints and wanted to be sure that we are getting the most from the software. Both Kent and LSE are looking forward to implementing the new features in EPrints 3.3, particularly the plugins to support the REF. The focus remains making it as easy as possible for academics to record their research outputs and increase the level of full text available. I was surprised to learn at the R4R Workshop that LSE does not have a Current Research Information System (CRIS). Kent is a pathfinder on the JISC Research Management and Administration Service (RMAS) and I wanted to explore how Dave would approach a similar project (which might include a CRIS or CRIS-like functionality). He stressed that the completeness, quality and volume of the data in LSERO would have to be taken into account when assessing the potential benefits of implementing a CRIS, and that in the short term developing LSERO was the Library’s priority. Use of KAR has fluctuated since RAE 2008 and I asked Dave and Natalia how they plan to build on the success of the mini-REF exercise. There are constantly monitoring deposit rates from departments to ensure that LSERO remains a current and accurate record of the LSE research outputs. This strengthened my resolve to put in place suitable strategies for the development and support of KAR – huge thanks to Dave, Natalia, Helen Williams and all at LSE and RSP who made my visit possible, informative and enjoyable. Author: Robin Armstrong-Viner, Head of Collection Management, University of Kent. UKCoRR is listing UK events in OA week on its blog. Make sure your activities are included! This guest post is authored by Diane Leeson, Content and Access Team Leader, Library and Learning Innovation, University of Hull. As announced last week, during October 2011 the RSP sponsored ten UK repository staff ‘buddy visits’ as part of our Open Access Week initiative. Further information available from here. 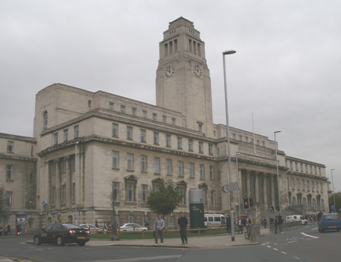 Diane visited the repository team at the University of Leeds, one of the partners in White Rose Research Online (WRRO). 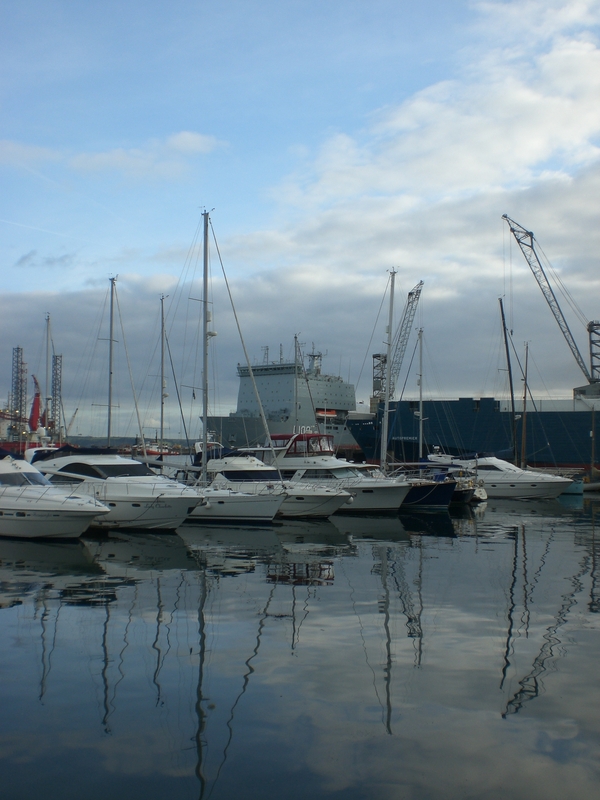 The University of Hull have recently launched their new digital repository, see Hydra in Hull. My proposal for a ‘buddy’ visit had been around wanting to find out more from those who have developed repository policies/mandates and also in issues around governance of their repository, including how those policies are embedded. I had no particular institution in mind so it was suggested that we could visit the University of Leeds who are one of the partners in White Rose Research Online (WRRO) and White Rose eTheses online repositories (WREO) along with the universities of York and Sheffield. While admitting they were not especially strong on policies we decided that it would still be a useful visit and it turned out to be a good general exchange of experience. So it was only a short train trip and walk from the city centre before I arrived at the building leading onto the Brotherton Library on 14th October. I was welcomed by Jodie Double, Digital Content and Repositories Manager, and also met some other members of the team. Firstly, Jodie, Gemma Storr and I spent some time in general discussion. I was interested to hear that WRRO was established in 2004 and includes research outputs for the three institutions and paved the way for the sister service WREO containing etheses from the 3 partners. We discussed both of these in relation to the University of Leeds only. They do have a mandate for deposit of etheses so students have to provide these, which are received as a disk containing a PDF and accompanying paperwork. The team then upload the theses and publish them on their repository. This is very similar to what we do at Hull. (At York and Sheffield the students do self-deposit). Leeds is just about to start adding more retrospective theses and intend to digitise in-house using the equipment within their new Digitisation Studio. One element which we both agreed on was that students were not always clear about the implications of publishing their theses on a repository and in some cases do not even realise that this is what will happen until they suddenly come across it via Google. Perhaps supervisors could advise students about this when they are preparing their theses? In the case of research there is no specific policy which states that all research has to be included on their repository. Staff are supposed to do this, but it is not enforced. Staff are generally positive about wanting to make their research more visible, but are often worried about copyright. Where full text is not uploaded there is sometimes just a metadata record included and a link can be made to the publisher version, but this will reduce access to only those people entitled to use it. Researchers at Leeds use the Symplectic system (a publications database) to enter the details of their publications. Repository staff then add these items to WRRO. If the full text is not the publisher’s version they will add a standard front page to clarify identification – useful if the user is accessing the pdf directly from Google for example. They will also deal with copyright issues, requesting permissions from publishers, and recording responses. Gemma was able to give me a closer look at the various processes involved. This whole area around publishing research is of interest to us at Hull since we are in the early stages of this process. We have just implemented a new Research Information System (Converis) and my team within the Library will play a role in validating entries and uploading any full text submitted to our repository. So it was useful to exchange information about this and discuss any considerations and issues. It was particularly interesting to hear about the copyright aspects since this will also be a concern to us, and I liked the idea of attaching copies of publisher responses to the record in the repository and this might be something we could adopt ourselves in future. A related area of open access concerns digitisation of existing collections to make them available online to foster new research. (This is separate from course readings digitised under the CLA licence which we are both doing already). Therefore, it was very interesting to have a look at the new Digitisation Studio which has just been set up at Leeds and managed by the repositories team. 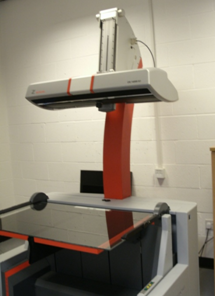 I spoke with Beccy Shipman who will be coordinating work in the studio and was able to see the equipment, such as the scanner shown below, which will be used. Apart from the digitisation of print theses, the main emphasis will be on picking out items from special collections to begin with. This also includes dealing with any related copyright issues. At Hull we have not yet ventured into this area of work, although we have spent some time identifying potential collections for digitisation. Seeing the facilities at Leeds brought home the scale of the investment and commitment needed if such work is to be done in-house. This will be useful to feed back to colleagues at Hull. Overall it was a useful visit providing the opportunity to see how things are done at Leeds, to make new contacts and to share some common experiences. WRRO is a more mature repository than our own and so the work around publishing research outputs was especially useful. In particular, there was mention of considering having a standard time period for making items live in order to manage expectations. This is not something we have done, but it might be worth looking into in the future. While Leeds is also a larger institution than Hull it was clear that their staffing resource for repository work is considerably greater than ours, although they are working with three separate repositories against our one and running copyright and digitisation services as well. We do expect that staffing will be an area we will need to address in the future as our repository work continues to grow. Finally, I would like to express many thanks to everyone I met at Leeds who took the time to show me their work and share information. They are most welcome to come and have a return visit to us in Hull if they would like to do so. Thanks also to the Repositories Support Project for sponsoring this visit.